The Pandora Directive is the fourth title in the Tex Murphy series that parodies the 1930's trench coat brand of thrillers. 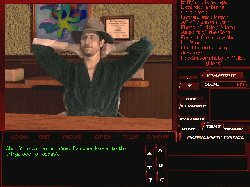 It follows along in the same 'interactive movie' mode as Under a Killing Moon (Tex's last adventure) and, as with that title, the video sequences slot smoothly into the game and develop the story very well, whilst still allowing for lots of fun and player interaction. The one set back here, of course, is the amount of disk space needed for video storage and the number of disks required to contain this volume. Pandora has six CDs so you won't get far before you are instructed to change disks. However, all is not lost, the game has several features to help you avoid this frustration. Firstly, the travel screen highlights the locations that are accessible from the current disk allowing you to organise your travelling to avoid constant disk exchanges and, secondly, even when that dreaded warning 'please insert CD x' creeps up on you unawares, you still get the opportunity to change tack and avoid the inevitable, for the time being at least. Also, as the manual points out, attempts have been made to combine sequences in the story on the one disk to help alleviate this problem. I encountered some disk swapping early in the game but soon learned to keep it to a minimum. In any event, the game is so good, this was only a minor inconvenience. Well, Tex Murphy hasn't changed much at all in this game. He still hasn't managed to overcome his resentment towards his first wife who left him, and he's still the same sentimental hero with hoards of keepsakes from his childhood cluttering his office and a tendency slip up occasionally and get hurt. In filling Tex's sneakers you get to direct the story along various paths depending on the things you do and the way you treat other characters. For each conversation you have a choice of adopting one of three 'attitudes', Mission Street (nice guy), Boulevard of Broken Dreams (hard-boiled PI) and Lombard Street (neutral). Depending on your choices you will progress towards one of seven different endings. After the introductory video you find yourself in the familiar surroundings of Tex's Office accompanied by a prospective client, Gordon Fitzpatrick. Of course, Tex is down on his luck as usual but things are about to rapidly improve. Gordon hires him (you) to find a missing friend, Dr Thomas Malloy, a scientist who was recently sighted in the company of an unknown young woman. In the meantime a young woman has just been brutally murdered, the work of a serial killer, or was it? Too coincidental maybe. Perhaps she was the mysterious companion of Malloy, maybe she is connected with your case. Your search for Malloy will be a long and tangled one. The story unravels with twists and turns and startling revelations involving covert government agencies, strange locked boxes, alien visitations, and more. By interrogating various characters and following up on all the leads you will work your way through quite a complex story with lots of puzzles to keep you on your toes. As some of the puzzles are quite 'taxing' it is very good to see that there are two difficulty levels -- Entertainment Mode and Game Player Mode. In the first easier mode some locations are absent and some of the trickier problems are omitted or simplified, whilst you are, of course, on your own in the second. As with Under a Killing Moon there is an on line hint system you can resort to when all else fails, however, when playing in Game Player mode you will pay for this 'momentary weakness' because getting a hint means changing to the Entertainment mode -- and there is no return. A bit mean, really, as continuing the game with missing puzzles and fewer locations is a high price to pay for one little peep. But, of course, there's always the restore function to restore your game and your self-respect! One of the features I liked in this game is the point system, that is, for each puzzle solved or each significant action your score will increase. Of course, adding to your points is unimportant in the scheme of things as you can complete the game without a full score, but for players like myself who like to be sure they have done absolutely everything, it adds immensely to the fun and the sense of achievement. In the Entertainment mode there is a possible 1,500 points, but for the Game Player mode this number increases to a hefty 4,000 points. Having completed the game in Game Player mode I was very disappointed when I fell short of the mark and this failure on my part was due primarily to the existence of 'timed' puzzles -- a big NO NO in my book as far as adventuring is concerned. The 'timed' sequences rear their ugly heads when you are presented with a logic-type puzzle to open a door or a box. It might be a puzzle where you have to calculate dates, fit together torn pieces of paper or other similar problems. For me at least very few were 'finishable' within the time limit. To score maximum points meant saving my game, studying the puzzle, then working out the answer before restoring and racing against the clock to complete it. Ultimately the exercise became pointless (pun intended), it felt like 'cheating' and in the final analysis I am an adventure game player not an arcade game player. Other than that The Pandora Directive is a delight for explorers and puzzle enthusiasts. The puzzles themselves are interesting and varied with some pure logic puzzles and others where the 'key' is somewhere in the game environment, as well as a crossword, a couple of mazes and a serving of good solid adventuring with lots of locations to explore and objects to find and manipulate. There are, however, two or three 'puzzles' where you are likely to visit the graveyard regularly before you succeed and these may frustrate some adventure players. In the Roswell Complex, for instance, your fate is sealed if you waste too much time. Here the tension is built up perfectly as a warning to be quick -- a little hint -- don't panic. There's plenty of time do to what's necessary to ensure your survival. The two other puzzles that are potentially frustrating, a roof top encounter and the Mayan fireball maze, both require precision movement. Adventurers shouldn't be too daunted as all that is needed for the first is a bit of practice and the second is simple when you know how. Believe me, you don't need fire resistant armour, a bit of patience should suffice till you find that easy way through. You don't even need to 'run'. That's right, amongst other things, you can run in this game, you can look up and down, glance behind, crouch and stand on tip-toes; and understanding all these moves is crucial to finding objects and getting through the tricky sequences mentioned above. The Pandora interface is the same as in Under a Killing Moon, with a first person perspective and full 360 degree movement. Unfortunately moving around still takes a lot of getting used to and can be quite frustrating till you get a feel for it. Also, there are two basic modes -- movement mode and interactive mode. In the first mode you travel around, look up and down etc, only in the second can you interact with objects and people in the game world. If in doubt, you can access the tutorial at any time during the game. Conversations are conducted in video sequences and they work well because they only 'star' the character being questioned, making them appear quite realistic. Other features include the ability to re-size the picture screen in movement mode, on-screen text for all dialogue, limitless save game slots and a very useful emergency save facility (under Win 95) that allows you to pick up a game where you left off in the event of a system crash. The Pandora Directive runs in DOS and Win 95. Even with its minor imperfections it's an astoundingly enjoyable detective story with all the ingredients of a satisfying game -- good characterisation, a variety of puzzles, lots of exploration, on screen text and two difficulty levels. I thoroughly enjoyed it despite once again failing to totally come to grips with the movement system. For me this was it's major weakness, but don't let me put you off as you might fare better. Because of the two difficulty levels it's an excellent game for both novices and experienced players. See the metzomagic.com Pandora Directive walkthrough. Copyright © Rosemary Young 1996. All rights reserved. Minimum: 486/66, 2x CD ROM, SVGA VESA compliant, 20 MB hard drive space, 8 MB RAM (12 MB for Windows) mouse, sound card. Recommended: Pentium, 4x CD ROM, SVGA Local Bus, 30 MB hard drive space, 16 MB RAM, mouse, 16 bit sound card.